Marchionne believes eliminating FCA's debt burden will allow the company to play a stronger role in industry consolidation. MILAN --Sergio Marchionne enters the final stretch of his career at Fiat Chrysler Automobiles with a daunting mission: prove wrong the doubters who question how he can make the automaker’s US$5.29 billion in debt disappear by the time he steps down in two years. His strategy update will be a closely watched presentation next week at the Detroit auto show, particularly as Fiat Chrysler won’t be unveiling new models at the annual event. Marchionne knows his credibility is riding on his 2018 targets: the CEO is demanding signs of progress toward reaching them at every management meeting, according to people familiar with the sessions. And the pressure is showing results. Fiat Chrysler’s executives have expressed increasing confidence at recent investor meetings that they will reach their goals, according to the people, who asked not to be named citing private conversations. Aiding Marchionne is a product shift to more profitable models such as Jeep SUVs and Dodge Ram pickup trucks instead of less popular sedans in the U.S. The lineup provides a buffer as industry conditions turn challenging, with growth in the U.S. and China topping out or slowing. Investors have taken note: the stock listed in Milan has surged 62 per cent since the carmaker raised its full-year forecast in late October, and analysts’ average share-price estimate has jumped 11 per cent to 8.26 euros a share. The shares on Thursday closed up 1.3 percent to US$9.81 on the New York Stock Exchange and continued rising Friday in Europe. Galliers, who expects Fiat Chrysler to boost profit in North America through 2018 despite the weaker market, raised his recommendation on the stock to buy from sell in November. The carmaker is likely to outline how it will reach the goals when it publishes last year’s figures at the end of January, the people said. Fiat declined to comment. But even with Marchionne’s improved strategy, the vast majority of analysts still expect the manufacturer to fall short of the targets. These include generating as much as 5.5 billion euros (US$5.82 billion) in adjusted net income, almost three times the 2015 figure, and turning a projected five billion euros in net industrial debt into at least a 4 billion-euro cash pile. The company could miss the adjusted-net figure by 42 per cent and carry over three billion euros of debt, according to analyst estimates compiled by Bloomberg. Marchionne, 64, is no stranger to public skepticism. Critics of his lofty goals have called them “fantasy land” and “not credible." The CEO himself backtracked a year ago, when he stopped promoting a goal of seven million annual group deliveries by 2018, which compares with Fiat Chrysler’s 4.6 million vehicle sales in 2015. Deliveries could be largely flat at about 4.8 million vehicles annually this year and next, research company IHS Automotive estimated in November. 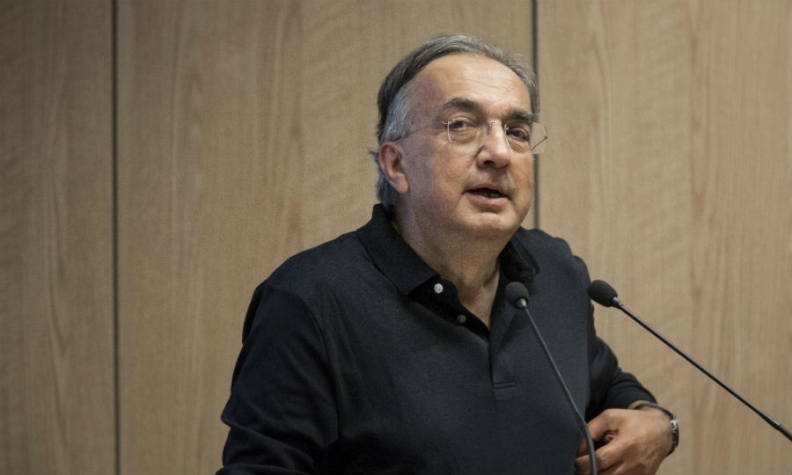 Marchionne, who could discuss the carmaker’s progress as he meets reporters Jan. 9 at the Detroit show, is looking to achieve the 2018 profit and debt targets with higher-margin vehicles after scrapping the car-sales goal. He’s also scheduled to meet investors at a Deutsche Bank conference in Detroit on Jan. 11. The CEO took the helm at Turin, Italy-based Fiat SpA in 2004 and, after turning the carmaker around, engineered the takeover of struggling U.S. counterpart Chrysler Group starting in 2009. Net industrial debt totaled as much as 11.4 billion euros as they combined fully in 2014. He has achieved some of the debt reduction through the initial share sale and spinoff of the Ferrari supercar division, which also involved shifting some of the obligations to the separated business. Further disposals are possible, though talks on selling the Magneti Marelli auto-parts business to Samsung Electronics broke down last year, partly over a valuation dispute, and the unit may be spun off like Ferrari. Fiat Chrysler could potentially also increase its value by separating premium car brands such as Maserati and Alfa Romeo, said Massimo Vecchio, an analyst at Mediobanca. Marchionne is set to receive a US$12 million payout when he retires at the beginning of 2019, and is entitled to stock currently valued at about US$43 million if the carmaker reaches 2018 financial goals including the profit target. He also maintains that eliminating its debt burden will allow the company to play a stronger role in what he sees as the inevitable consolidation process in the auto industry. Since GM rebuffed his overtures two years ago to combine, Marchionne has said finding a partner for Fiat Chrysler will probably be the job of his successor. Leaving a debt-free company could be his ultimate legacy, unless changing market conditions and new policies set by U.S. President-elect Donald Trump give him one final chance to complete a major deal.